Buying new strings for your violin (or viola, or cello)? There are several things you need to know before you press “buy.” Some of them you probably never even thought of before. I’ve had string players in my home for over 20 years, and still had to ask several questions before our last string purchase. There are so many options! How do you figure out exactly which strings to buy? And how do you know when to get new strings? Let me help you figure this out. When Is It Time for New Strings? First Big Question – When is it time to get new strings? How do you know? Guess what – there is no easy answer! Strings do not come with expiration dates. They don’t turn colors when they need to be replaced. The answer is somewhat subjective. Obviously, if a string breaks it must be replaced. But what about the ones that don’t break? If the end of the string is starting to fray or unravel, it is probably time for new strings. It is probably time for new strings if you are having to work harder than usual to get the sound you want. If your strings are unresponsive, or dull-sounding, you probably should get new strings. Having a hard time getting your strings to stay in tune? That might also be a sign that it is time for new strings. The more you play, the more frequently you need to replace your strings. For an advanced player, someone practicing several hours a day, strings probably need to be replaced every 3-6 months. 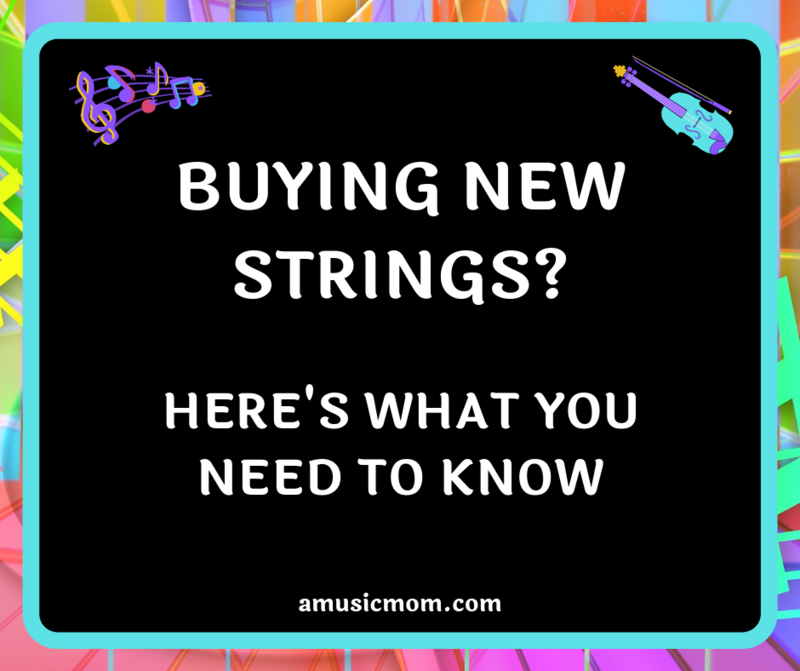 What do you need to know before placing an order for new strings? A Lot! Not only do you have to know the correct instrument and size, and which strings, but you have to know what type of end you need on the string, gauge, brand, core, tension, full set or not, etc. Let’s take a look at each of these. What Instrument, What Size, What String? First, you must specify your instrument, the size of your instrument, and the string you want. Be sure you choose the strings for your instrument – violin, viola, cello. OK – this seems basic, but you don’t want to be careless and make a mistake and order the wrong strings! And then, if you are not ordering a full set of strings, be sure you order the correct string. Full Set of Strings or Individual Strings? Which brings us to the next question. Do you need a full set of strings (all four), or are you just replacing one string? Do you want the same brand of strings for all four strings, or are you planning to mix brands? Know that you can buy a full set of strings, or you can purchase strings individually. For younger players, you will probably be well served by just buying full sets of strings. How Do the Strings Attach to your Instrument? You need to know how your strings attach to the tailpiece of your instrument. Do they have a loop at the end, or a ball at the end? And sometimes strings come with a tie knot. Tie knot ends attach the same way that ball ends strings do – the knot replaces the ball. And some strings now are sold with removeable balls – you can use it with the ball or remove the ball and have a loop end. If you don’t know which end you need, ask your teacher or orchestra director. If any of your strings have fine tuners, strings with ball ends work well for tuners with two prongs, and strings with loop ends work better for tuners with one prong. The next two things you need to think about are cores and wrappings. Strings are made with one of three core materials: gut, synthetic (composite) or steel. Each core material affects both the sound of the string and its responsiveness. Gut core strings offer a full, rich, complex tone. Steel core strings are often very bright-sounding, and they tend to produce a more “metallic” sound. Synthetic core strings are similar in sound to the gut core strings but are more resistant to temperature and humidity changes. They hold their pitch a bit better than the gut core strings. Often these strings are wrapped or plated with a different material – like aluminum, silver, gold, or titanium. How to choose? Each material will affect the response and tension of the string. Also, some may react with an individual’s body chemistry differently. Finally, you must decide on gauge and tension. Most student violinists (violists, cellists) will be fine with medium gauge and medium tension. Gauge measures the thickness of the string. While most will want medium gauge strings, the other options are thinner (or “weich” or “dolce”) and thicker (or “starck” or “forte”). Tension refers more to how hard you must press on the string, or how pliable the string is. Unless you have a specific reason for “lighter” or “heavier” most people use a medium tension. Where to Buy and How Much Will Strings Cost? You have figured out all the details you need for buying your new strings. Now, where will you buy them, and how much will they cost? Start with your local music store – see if they have what you need. If you are buying basic student strings, your local store should have them, especially if they service or provide school instruments. And if you break a string the day before your performance, your local store could be a godsend. How much will they cost? As you search, you will find that the cost can vary a lot, based on the strings you want and the instrument you play. A full set of student violin strings will be between $15 and $20 while a full set of better quality strings for violin could be $150 or more. A full set of student cello strings is about $50, while a set of higher quality cello strings could cost over $250. Put the Strings on the Instrument – No Easy Task! 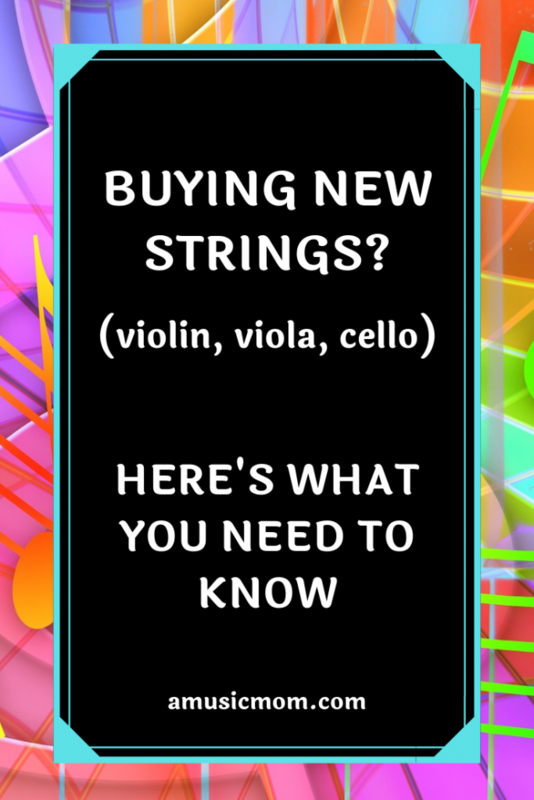 You might want to check out these other resources for more information about buying strings. This is a great article explaining the different kinds of strings, gauges, tensions, etc. Read here. Here is another article about choosing and buying strings. This article explains the process of changing strings. Here are some other sources I used for my research. Read here, here, and here. Welcome to A Music Mom – an informative site for moms (parents) of music students and students of music. We have informative posts about music lessons, music history, and music theory. Join us as we enjoy music together!